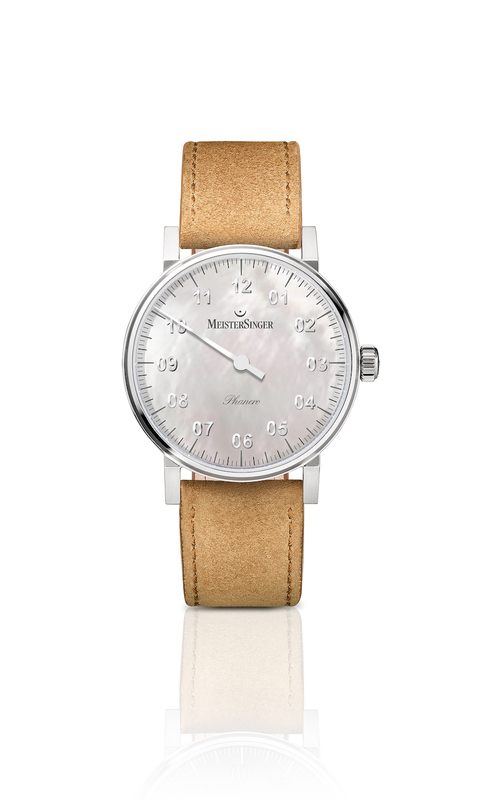 Meistersinger hit a homerun at this years edition of Baselworld with the Phanero. With a diameter of 35mm this watch is not only their smallest, but also their thinnest with a height of 7.5mm. Perfect for a lady? Indeed, and especially the two new models that Meistersinger just introduced within the Phanero line! The most distinguished difference between these two models and the existing ones, is the mother-of-pearl dial. It adds a generous dash femininity to the watch without making it too fragile. This is mainly because the case still has the same straight forward, no-nonsense design of the other Phanero’s. 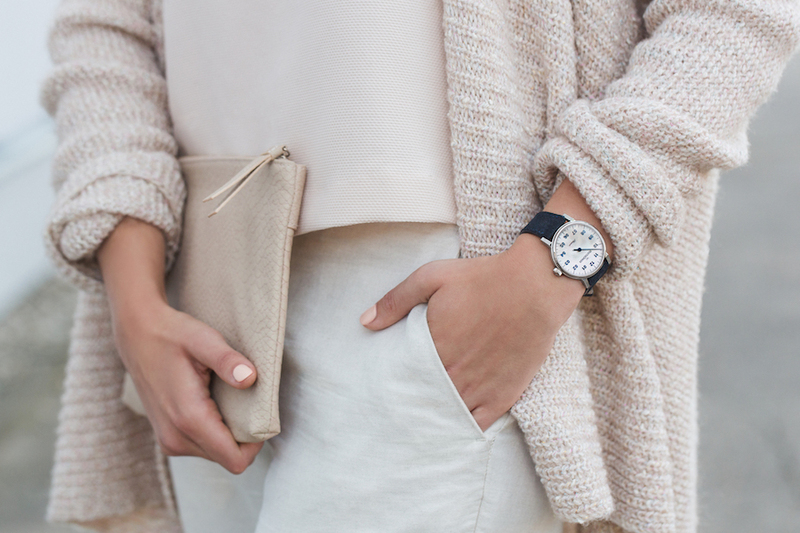 Combined it makes the watch look contemporary, powerful, and yes, feminine. Staying true to the Meistersinger code is also the Phanero a mechanical watch, and you can admire the well decorated movement through the glass back. That is of course when you are not admiring the mother-of-pearl dial. 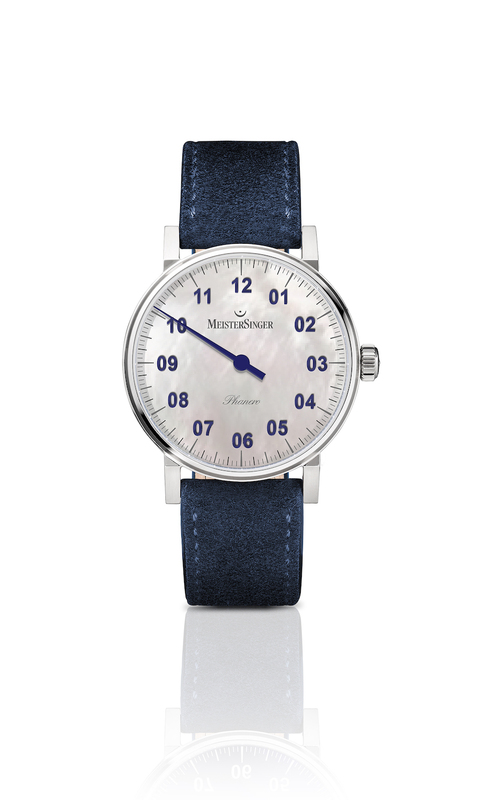 Meistersinger had created it in two versions: one with a blued hand and blue numerals. This one is the easiest to read because of the contract with the mother-of-pearl dial. There is also a version with a polished steel hand and numerals. Although slightly more challenging to read the time, also thanks to the beautiful shimmer of the mother-of-pearl dial, does the lack of contrast also makes this one the more classical of the two. The straps on the new Phanero’s are made out of suede. This makes the watch look slightly more casual, as when Meistersinger would have opted for an alligator print or silk, and it suits the watch. What also suits the watch is its price tag of 1.549,- euro’s. It is a fair amount of money for a well made watch, with a unique complication, and a Meistersinger has never looked as feminine as now! We had the pleasure of interviewing Meistersingers founder and CEO, Manfred Brassler, for the latest issue of Watchisthis?! Magazine, which you can read for free here. More information on the new Phanero’s you can find on the Meistersinger website.